The property comprises a high specification four storey office building over a basement carpark designed by Scott Tallon Walker Architects. The building was constructed in 2006 on a structural frame with concrete block, architectural metal clad faÃ§ade with extensive glazing, concrete floors and mainly flat concrete roof. The office accommodation is on either side of a feature full height atrium with a glazed roof. There is a feature spiral stairs and two passenger lifts serving the upper floors. Access to the property is from Eglinton Street through a revolving door. The ground floor is laid out with a reception area, break out area, canteen with kitchen and large seating area in the atrium, offices, toilets and service accommodation. The upper floors are laid out with office accommodation, break out areas and toilets on each level. The offices are finished internally with raised access floors and air conditioning. There is an external terrace at third floor level. 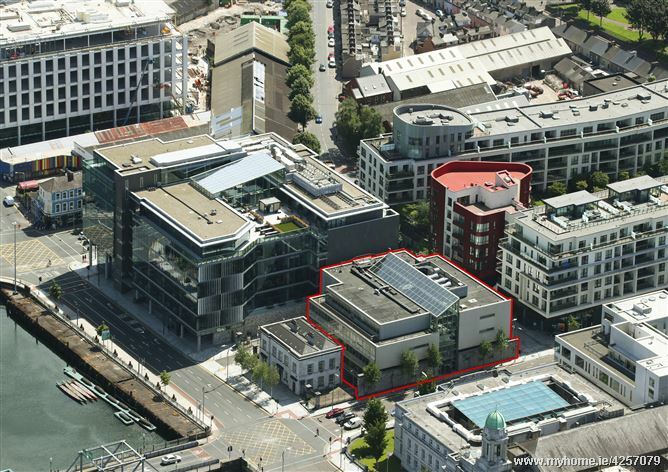 The entire property, with the exception of five basement car spaces, is let to Ervia on a full repairing and insuring lease that commenced on 8th May 2014 and will expire on 13th September 2033, at an initial rent of €800,000 per annum. There are five yearly rent reviews to the higher of (1) the initial rent increased or decreased in accordance with the movement in the Consumer Price Index or (2) open market rent. There is a tenant break option at the end of Year 15 on 7th May 2029 operable with a minimum of 12 months prior written notice. Five separate basement car spaces are let to Cork City Council on a licence agreement for a term of 700 years from 27th July 2005. Prime City Centre office building with significant reversionary potential. Entire let to Ervia with 10.8 year term certain. Current rent €800,000 per annum.